Four years ago, my husband and I chose to make our home here on the Nature Coast of Florida. We're about 90 miles west of Orlando and about the same distance north of Tampa. We were looking for a more rural setting away from the bustle of city life; a peaceful and quiet area. 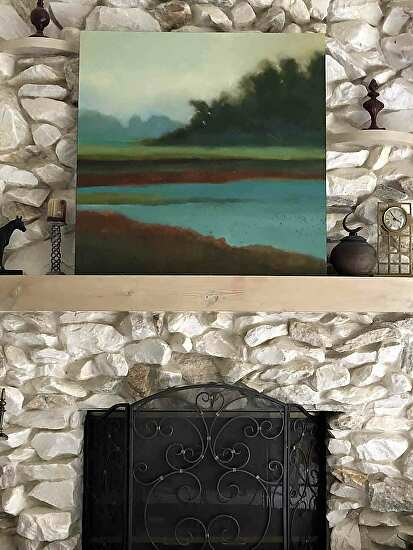 We are surrounded by beautiful lakes, marshes and rivers with spectacular misty mornings and colorful sunsets, all of which provides me with lots inspiration for my paintings. Of course, we also have a lot of wildlife such as deer, sandhill cranes and gators. I don't see the gators very often, but I don't go looking for them either! This painting is inspired by the name of a road near our home. I had to look up the word "slough" for its meaning and pronunciation. I discovered that it can be pronounced "sloo" or "slou" (rhymes with cow) and refers to wetlands, swamps and marshland. But, and this is the interesting part, it can also be pronounced "sluff' and that refers to snakes shedding their skin. And, of course, whoever picked the name of the road was not referring to a shoe, when they chose to include "moccasin". No, I won't be looking for them either. I'll just stay in the car, take a few pictures and leave it at that!